Interest among utilities in owning wind and solar assets is steadily growing, and the mechanisms for building and acquiring renewables are quickly evolving. Utility companies like Colorado’s Xcel Energy are stepping up their efforts to meet clean energy standards. Corporate contracts accounted for 22 percent of renewable power-purchase agreements in 2018, and that percentage is poised to grow. New methods like the build-transfer agreement (BTA) have allowed utilities to more actively explore utility-owned renewables. The structure of these BTAs will change, however, when the federal Production Tax Credit (PTC) expires in 2020 and as the Investment Tax Credit (ITC) steps down to 10 percent. 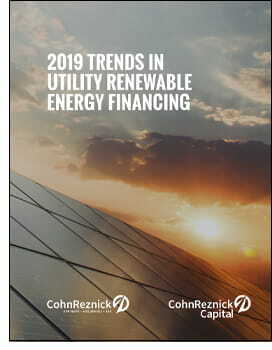 These and other factors highlight the importance of keeping up with trends in utility renewable energy financing. Stakeholder demands, sustainability targets, energy cost certainty, and the increasing cost-competitiveness of renewables will only increase the demand for clean energy in the corporate and municipal sectors moving forward. Download our mini-brief with insight from GTM to learn more about these top trends in detail.